April is the month that President Obama will deport the two-millionth immigrant since the beginning of his first term—the largest number of any president. It is also the month that the House—again—refuses to address any undocumented immigrant legislation despite the bill sent them from the Senate. Protesters rallied across the nation today in Not1More demonstrations in an effort to stop the country from separating families through deportation. Immigration activists are also holding Fast for Families at the National Mall on April 7-9 to culminate the past month of action with over 1200 women fasting through 70 events in 35 states, Washington, D.C., and Mexico City. Women and children compose three-fourths of all immigrants, but only 25 percent of work visas are provided to women. Easily renewed H-1B visas for “highly skilled” workers, mostly given to men, are stepping stones to permanent status. Women are left with “dependent” visas for spouses, H-4, which prohibits them from working. Stanford Law School’s Vivek Wadhwa testified to the House Judiciary Committee that Saudi Arabian women have more rights than wives of H-1B visa workers. These “dependent” women have no recourse against their husbands’ abuses. In the reauthorization of the Violence against Women Act, Rep. Eric Cantor (R-VA) and other GOP leaders blocked protections for immigrant women as they now oppose immigration reform. In their efforts to arrest immigrants, hundreds of black-garbed men from the Department of Immigration and Customs Enforcement (ICE) descended on a meat packing plant in Postville (IA). The 2008 raid was the largest raid in any workplace and the only one that fabricated a charge of identity theft to deport the immigrant workers. All the men among the 400 workers were tried within 48 hours, threatened with two to three years in prison waiting for a trial if they didn’t plead guilty to a 165-day prison term. Forty women were left in Postville to care for their children. They could not find work or leave the state or work; all of them had electronic trackers. According to Gibbs, the women left their native countries, mostly either Guatemala or Mexico, to work in the United States because of extreme poverty, their children’s malnutrition, violence against women with impunity, and violence in the country. Genocide during a 30-year civil war in Guatemala was a large factor. Only 2 percent of the 10,000 rapes in Guatemala in one year were brought to trial. Because of the drug trade, Mexico has seen 48,000 deaths in the past five years. In addition, women working in factories are disappearing at an alarming rate and discovered mutilated, raped, and dead. Undocumented workers, especially women, are helpless in the face of employer abuses—sexual harassment, underpayment, unsanitary and unsafe conditions, lack of training, etc. Workers are demeaned, shouted at, and constantly fearful of deportation, which would put their children back into a life of malnutrition and danger. At 14, children work in slaughter houses, run heavy equipment, and have contact with dangerous chemicals. No one has safety equipment unless inspectors alert employers to coming into the plant, and workers are charged for this equipment for the short time that these items are used. The raid caused children to become openly angry, either acting out and pushing others, or silent and introverted. They suffered from separation anxiety because mothers were ashamed to tell children the fathers had gone to jail. Even good students refused to return to school because that’s where they were during the raid, but they avoided being home because their fathers were gone. They also evidenced worry, extreme fear, confusion, guilt, and shame. Many children not directly involved in the raid experienced many of these behavior patterns because of what had happened to their friends. One reason for the large number of deportations is the Congressional Bed Mandate, the so-called “requirement” that 34,000 undocumented immigrants be detained every night at a cost of $5 million every day. That totals $2 billion a year, $10 billion since President Obama took office. The money goes directly to either the private prison industrial complex or cities and counties that house immigrants. Contracts for private prisons force taxpayers to pay whether prison beds are empty or full. The advantage to prison companies is that inhumane treatment for undocumented immigrants in prison doesn’t produce an outcry. 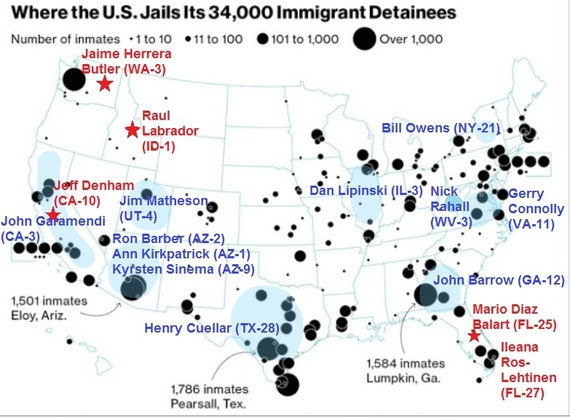 The number of detentions has grown from 70,000 in 1996 to 400,000 in 2012 because of “mandatory detention,” initiated in 2007. With no hearing, the sick, the elderly, pregnant women, asylum seekers, torture survivors, victims of human trafficking—even green card holders and legal residents of the United States—are detained because ICE cannot release immigrants and judges cannot review individual cases. The Illegal Immigration Reform and Immigrant Responsibility Act of 1996 prevents ICE from deciding which detainees are eligible for alternative forms of supervision. Congress also refuses to give discretion to federal judges to assign detention on a case-by-case basis. While detention costs $164 per day, community-based supervision programs can cost as little as $12 for the same time. Yet the agency’s budget for alternatives is less than $100 million as compared to the $2 billion detention budget. Last June, the Senate expanded the use of alternative methods, but the House rejected it. A National Immigration Council report found that “between 2009 and 2011, over half of all immigrant detainees had no criminal records. Of those with any criminal history, nearly 20 percent were merely for traffic offenses.” ICE mostly deported immigrants who posed “a threat to no one.” Only one in five deportees qualified for a “Level 1″ priority, a category that once encompassed crimes like murder and federal drug trafficking, but now has broadened out to include “theft, filing a false tax return, and failing to appear in court.” Other immigrants were deported for much less. President Obama’s budget for next year proposed a reduction in this area with fewer beds, but Congressional members won’t deny their constituents such a profit-making deal. Thus both Democrats and Republicans want to retain the “bed mandate.” Congress will reduce funding for food, lodging, education, and other basic needs but not for prison and defense budgets. Treatment of immigrants is unjust, inhumane, and costly. It actually promotes crime because women are afraid to report sexual assaults and abuse whether in their home, on the streets, and at their jobs. It is time for reform.